Hawaii waterfalls of the Big Island are some of the grandest in all the world. And since most of the moisture falls on the eastern slopes of the Big Island volcanoes, the lush tropical rainforest on the east side of the island is naturally where we find most of the waterfalls. Wailuku River State Park is a great place to start. At 28 miles in length, the Wailuku River is one of the longest rivers in Hawaii. It is also one of the largest in terms of average discharge. Each day an average of 275 million gallons of water are carried down the Wailuku to Hilo, but during intense storms the discharge can increase more than 20 times. The headwaters for the Wailuku River begin high up on the eastern slope of Mauna Kea Volcano. Making its way toward the ocean, the river roughly flows between the lava that poured down the slopes between Mauna Kea and Mauna Loa. Wailuku in Hawaiian literally means water of destruction. Visitors will understand why when viewing the Wailuku River's runoff following a period of heavy rainfall. The 16-acre Wailuku River State Park includes a number of scenic and dramatic waterfalls, including our first stop, Rainbow Falls. At Rainbow Falls, known also by its Hawaiian name Waianuenue, or rainbow water, the Wailuku River plunges 80 feet (24 meters) over a natural lava cave to the pool below. Multiple ribbons of water cascade over the falls when the flow is high, as in the image above. Note the contrast in the image below, taken after an extended period with little rainfall. If the sun is out, the best viewing time is in the morning to capture the rainbow, with the sun in the east. If there's no sun, there's no rainbow so it really doesn't matter when you go! Because Rainbow Falls is so easy to access (and free), you may run into tour buses and hoards of tourists. For that reason and the improved chance of seeing the rainbow, we recommend an early morning visit. To reach Rainbow Falls from the north side of Hilo, drive east on Waianuenue Avenue just over 1 mile. Turn right onto Rainbow Drive and follow signs to the Rainbow Falls parking area. Continuing on Waianuenue Road another mile past Rainbow Falls brings us to Boiling Pots and 60-foot (18 meter) Pe'epe'e Falls. There is a paved trail leading to the viewing area. Visible from the bridge less than a mile past Pe'epe'e is Wai'ale Falls. For a closer look there is also a trailhead just past the bridge. The trail is sometimes faint and overgrown, but otherwise it's an easy 10 minute hike to the falls. Next it's off to 'Akaka Falls State Park﻿. Heading north from Hilo on Highway 19, look for the sign to 'Akaka Falls between the 13 and 14 mile-markers. Turn west and drive for about 3.5 miles. 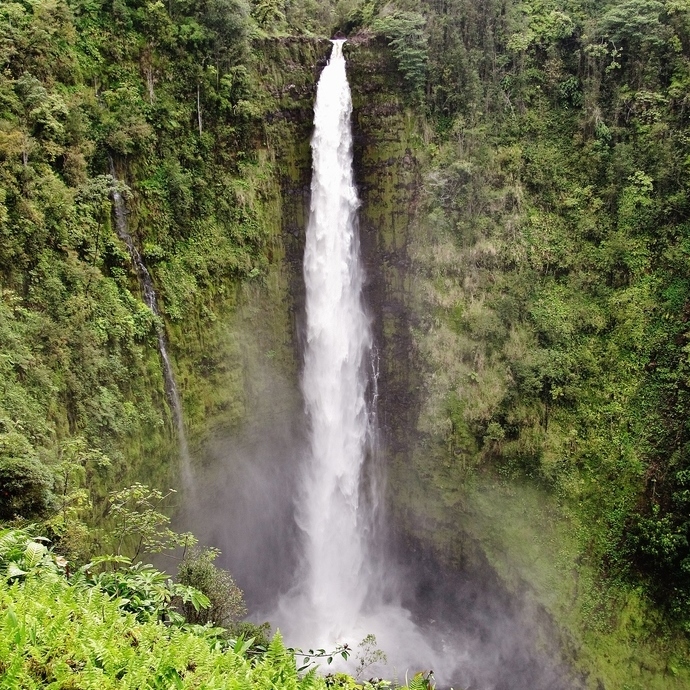 'Akaka Falls may just be our favorite of the many amazing Hawaii waterfalls. From the parking area there is a paved pathway to the falls, lush with thick vegetation and a variety of streams. The most direct path to the falls is an easy trail to the left. The preferred longer (15-20 minute) path around to the right provides a view of another waterfall, Kahuna Falls, and weaves its way through bamboo thickets and under a fantastic canopy of huge rainforest trees. 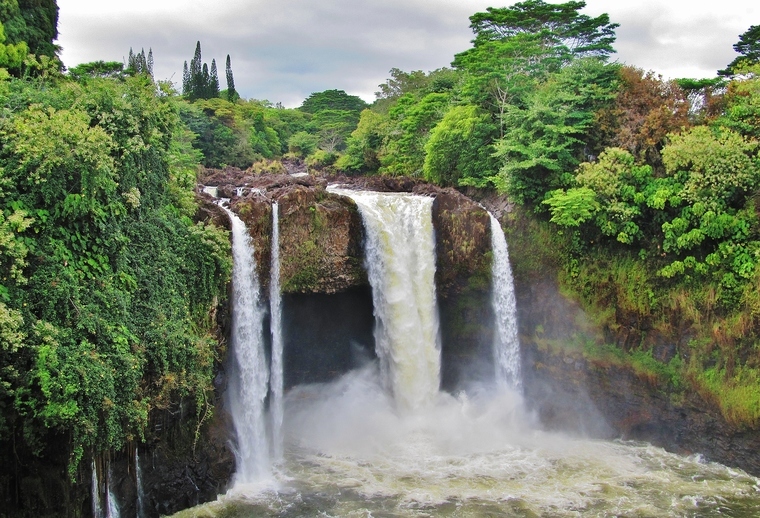 'Akaka is a truly breathtaking Hawaii waterfall. Watch in amazement as it makes its 442-foot (134 meter) freefall into the pool below. Umauma Falls is a beautiful multi-tiered waterfall off of Highway 19 north of Hilo. Despite what you may have read elsewhere, there is no access to Umauma Falls through the World Botanical Garden. It is only accessible by paying $6 to enter the Umauma Experience, across the road from the World Botanical Garden. Turn off Highway 19 north of Hilo between the 16 and 17 mile-markers and follow the signs. Being young geologically, most waterways on the Big Island are not well defined. During periods of heavy rain, waterfalls can appear as if by magic in areas where streams don't normally flow. 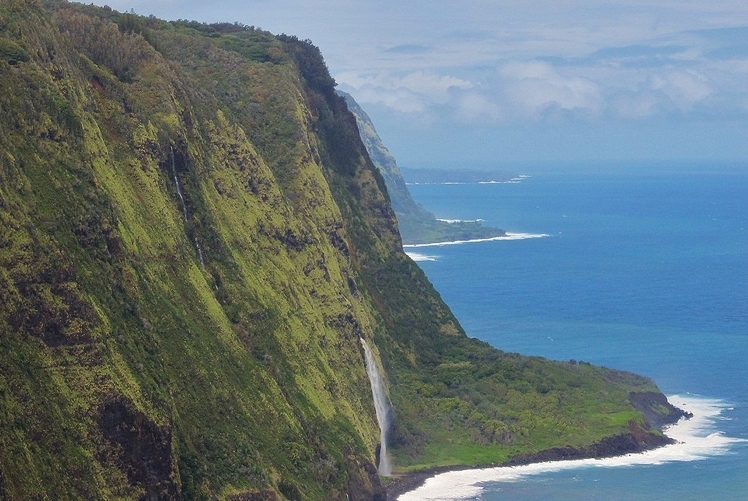 When there is lots of rain along the north coast, spectacular waterfalls can often be seen plummeting down the cliffs adjacent to Waipi'o Valley. Even more waterfalls will be found cascading down the sides of Waipi'o Valley's inner reaches, visible only by hiking deep into the valley. 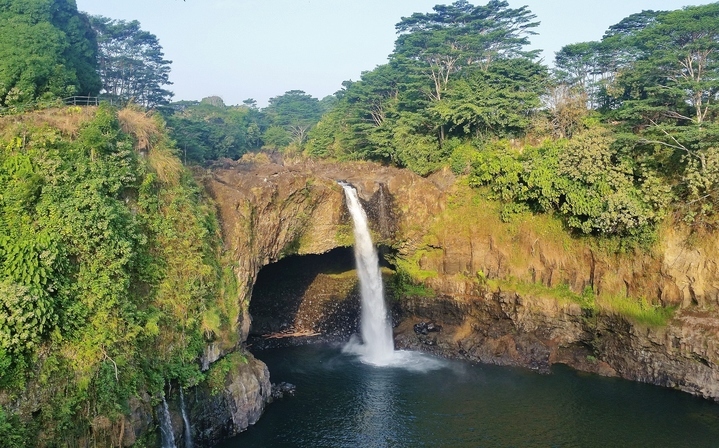 Which of the Big Island waterfalls do you think is most stunning?